Misia is our German Shepherd (4-yrs old at the time of this video). She’s a real sweety, very intelligent, and has high energy when it’s time to play. She LOVES playing fetch. And when it snows, she’s in heaven! In late January 2011, we received some record levels of snow. 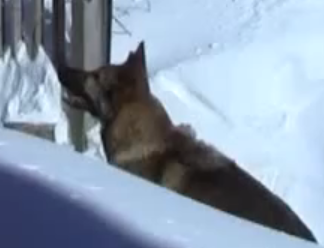 So, before the backyard became too trodden, we grabbed the video camera to capture how Misia tackles the deep snow. She really goes to town!